This article was excluded from the main body of the source criticism due to the popularity of the Shaqshaqiya sermon. 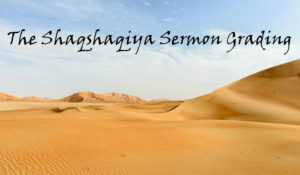 There are other known sermons like Al-Qasi’a and Al-Ashbah which were not excluded. However, they are nowhere as popular as Shaqshaqiya, not only in the eyes of Shia laymen, but even scholars. It is a common misconception among most Shias today that Shashaqiya is an authentic sermon by Ali bin Abi Talib, simply because it is mentioned in Nahjul Balagha. However, as we have previously stated on our FAQs page, Al-Shareef Al-Radhi did not provide chains to the sermons except in a few where he clearly mentions his sources, and ironically, those sources are unreliable according to even Shia standards. With this in mind, it is simply non-academic to rely on a book that was written in the year 400 AH when the vast majority of the work does not provide any early sources whatsoever. It is with this background that Abdul-Zahra’ Al-Hussaini spent fifteen years gathering alternative sources for Nahjul Balagha in order to give the sermons and letters some legitimacy. The Shaqshaqiya sermon is not any different for Abdul-Zahra’ provides seventeen sources in order to strengthen the reliability of the sermon. One might argue that the existence of variant sources provides the reliability of a report. However, there is no proof that these sources did not take from one source or simply quoted from one another. The first chain that is provided by Al-Saduq contains several problems. The chain includes narrators that are anonymous in status like Mohammad bin Ibrahim Al-Talqani and Yayha bin Abdul-Hameed, both were declared anonymous by Al-Jawahiri in Al-Mufeed min Mu’jam Rijal Al-Hadith p. 483, 664. The chain also includes other anonymous narrators like Ali bin Khuzaima and Ahmad bin Ammar bin Khalid. Furthermore, Ikrimah, the mawla of Ibn Abbas was weakened by Al-Kashshi. The second chain that is provided by Al-Saduq also contains problematic narrators like Mohammad bin Ali Majeelouyah who is anonymous according to Al-Jawahiri p. 559. It contains Mohammad bin Khalid Al-Barqi who was weakened by Al-Najashi. It also includes Ikrimah, like the previous chain. Al-Tusi’s chain is no better than Al-Saduq, for it suffers from four anonymous narrators: Hilal Al-Haffar, Isma’eel bin Ali bin Ali Al-Da’bali, Ali bin Ali Al-Da’bali, and Mohammad bin Salama Al-Shami. Refer to Al-Jawahiri’s Al-Mufeed p. 655, 68, 405. The chain provided by Qutb Al-Deen is perhaps the worst of all, for almost all the narrators in it are anonymous in status, including Ibn Mardawaih, Al-Tabarani, Ishaq bin Sa’eed, and Khulaid bin Da’alaj. As for Ibn Tawus, we find that he is quoting Al-Gharaat by Al-Thaqafi, which is a book that is not relied upon. See Usool Ilm Al-Rijal by Ayatollah Muslim Al-Dawri 1/504-506. It is important to also be aware that the chain contains several unknown narrators. Above, we have provided the hadith grading of Shaqshaqiya based on Shia standards, and it is not any different according to Sunni standards, for none of the authors of the sources above are seen as reliable by Sunnis in the first place, and thus, they cannot be relied upon. 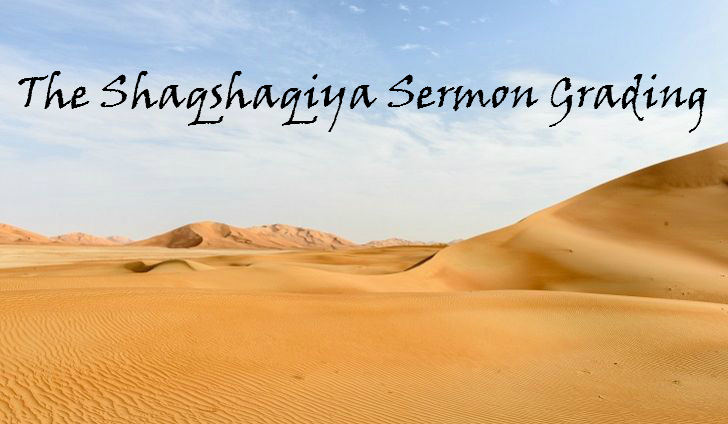 The Shaqshaqiya sermon is has been given a free pass for too long simply because it can be found in Nahjul Balagha. However, the objective reader will find that the sermon is simply too problematic for it has multiple weaknesses in each chain, and therefore, it should not be attributed to Ali bin Abi Talib, may Allah be pleased with him.